What is Backup Storage and What's the Difference to Traditional Storage? Thinking that cloud storage and cloud backup are basically the same is a pretty common misconception we encounter here at Cloudwards.net. Some believe the model used by storage providers like Dropbox and Google Drive to be the only decent way of remotely containing their data. Thinking like this means never fully appreciating the advantages of convenience and security that using a dedicated backup solution, like Carbonite, can offer. In this article we’ll explore differences between cloud storage and cloud backup and clear up the confusion once and for all. The goal is to help you fully utilize two unique approaches to cloud computing designed to accomplish fundamentally different tasks: work productivity and data recovery. Not long ago, talk of storing data in the cloud was frequently met with alarmed skepticism. The principal target of concern was security, which turned out to be a pretty well-founded concern. Data breaches like the 2012 Dropbox incursion and government surveillance programs like the NSA’s PRISM project are cautionary tales for anyone storing their data in the cloud. However, thanks to the public outcry after such scandals, governments and corporations stepped in to strengthen security measures, implementing zero-knowledge security measures, for instance. Such progress is welcome news since, properly done, keeping your data in the cloud has many benefits over local storage. Remote data storage means less worry about the impacts of a crashed hard drive or stolen computer. Reputable cloud storage and backup solutions go to great lengths to ensure your data is preserved in perpetuity. Carbonite, for example, accomplishes this goal with focus on three key areas: redundant storage, hardened data center facilities and system-monitoring software. Redundant storage ensures that even in the event of a server failure, a backup service will still have a copy of your data. The chief architectural component behind Carbonite’s particular strategy is RAID 6 (Redundant Array of Independent Disks). It’s redundant and independent because Carbonite spreads your data across fifteen different disks with at least three copies of each data block. Should one disk fail, the data blocks on that disk get instantly hot-swapped to another disk so that there will always be at least three copies. The term “hardened data center” applies to a data center built to withstand natural and man-made events. This includes earthquakes, floods, fires, hacks and even acts of terrorism. Different cloud storage services go about hardening their data centers in different ways and to different degrees. Carbonite accomplishes this goal by housing their servers in facilities that are climate controlled and feature independent AC systems and on-site generators. They further secure their property with 24/7 security patrols, CCTV surveillance and biometric scanners. System-monitoring software is designed to detect and prevent file corruptions. Carbonite’s take monitors server disks for errors to prevent files from being written there, in addition to monitoring the actual files themselves for potential corruptions. This overview of Carbonite’s approach to preventing data loss is just to highlight a few key areas good cloud platforms focus on to make sure your data is never lost. You can read more about the extensive measures Carbonite puts in place to protect your data in their very informative security white paper. Another advantage to keeping your data in the cloud is that it allows you to get at that data from different devices. For both cloud storage and backup, that typically includes browser-based access. The ability to get at your data via a browser means you don’t have to download an application to do so. This is especially handy if you’re working from a device that isn’t your own. Both online storage and backup also offer various ways of automating the transfer of data to the cloud. This saves you from having to manually manage the process, besides some initial setup. How these two different types of cloud storage approach this process of automation is actually one of the key components that distinguish them from one another. Most cloud storage solutions hinge upon the creation of a file folder on your device. Conventionally dubbed a “sync folder,” this folder looks and behaves like any other system folder but with one crucial difference: it’s connected to the cloud. Content kept in this folder is still stored on your hard drive. However, it’s also copied to the cloud in real time. Likewise, any changes made to the file in the cloud get copied to your device. There are two benefits to this mechanism. First off, there’s no need to mess around with thumb drives, which have a tendency to go missing. Secondly, it lets you hop from device to device and work on the same content without missing a beat. It’s because of these two benefits that cloud storage is ideally suited to boosting productivity. That’s why features such as sharing and integrated work applications are becoming increasingly commonplace with cloud storage. A good example is the Google Docs platform, a collaboration-powered office suite without which freelance writers like me would have a much harder time getting work done. With Google Drive you can share your work with others. From within the Docs program, collaborators can then make or suggest changes — a feature my own editor is rather fond of. To minimize the effects of miscommunication, most cloud storage platforms also incorporate some degree of deleted file and version recovery. Coupled with the fact that cloud storage services typically offer large amounts of storage space at a reasonable cost, it’s no wonder that many people think cloud storage is a pretty good way to backup their hard drive. The issue with using cloud storage for backup derives largely from the very thing that makes them so convenient: By having to move all of the content you want to backup into a sync folder, you’re forced to dismantle your device’s file structure. Moreover, most cloud storage solutions don’t offer a convenient way to manage the backup process. Backup solutions like Carbonite, meanwhile, approach the file storage process in a way that makes them ideally suited to protecting your hard drive with minimal compromise and hassle. After you install the Carbonite application on your computer and boot it up, it immediately starts scanning for files to backup. Many online backup services like IDrive and CrashPlan require that you tag files and folders you wish to keep. The file-selection method employed by Carbonite works well when you keep in mind that the service also gives you unlimited backup space — there’s no need to pick and choose which files are most important to you. In case a file type isn’t automatically backed up or you turn off Carbonite’s auto-selection feature, you can also right click and mark files and folders for backup. By not restricting you to the sync-folder model of cloud storage, you don’t have to worry about making sure you’ve actually moved all of the content you want to backup into that single folder. This also means that if you need to replace your computer because of a hard-drive crash or other mishap, you can restore your exact file structure on your new device. In addition to grabbing files from a web UI, Carbonite and other backup solutions let you restore content directly from their respective desktop applications. From Carbonite’s desktop application, you’re given the option of grabbing specific files or performing a full restore. The other advantage online backup offers over cloud storage is that such solutions let you schedule bulk file transfers. Scheduling lets you plan periodic backups for when you’re not actively using your computer. This is pretty useful, since such transfers can impact system resources. After you complete your initial full backup it’s often best to enable backups to occur in real time. That way, should something happen to your device prior to your scheduled backup, you won’t lose your work from that day. Not all online backup services manage real-time backup — or continuous backup — very well, though. Carbonite and few others do thanks to clever algorithmic solutions like block-level file backups. With block-level backup, once a full backup of a file has occurred, only the changed portion of the file is transferred going forward. By not copying the entire file over and over every time a file changes, it saves both time and bandwidth. Another advantage to safeguarding your data in a cloud backup repository as opposed to cloud storage is that backup solutions frequently feature better encryption models. This is partially because for cloud storage solutions to integrate with work productivity apps, they need to enable API access, which requires some level of access to your content. Solutions like Carbonite, meanwhile, can work in features like end-to-end encryption (available on Carbonite business accounts) without having to worry about breaking third-party app functionality. By using cloud storage to enhance your work productivity and cloud backup to protect your hard drive, you’ll be positioning yourself to take full advantage of the best of both tools. The best way to do this is to make sure that any files you have stored in your cloud storage sync folder are being simultaneously sent to your cloud backup solution. This is where Carbonite’s simple click-and-store approach comes in especially handy, since you can just tag any file or folder for backup. If you let Carbonite automatically scan and backup files of a given type, its gets even simpler, since the service will automatically copy content in your sync folder regardless of whether you’re using Dropbox, Google Drive, Sync.com or another service. Dual storage also gives you extra control over your content in case of an unwanted changes, file corruptions or accidental deletions. As mentioned, many cloud storage solutions offer deleted file and version control. However, sometimes these options are pretty limited. OneDrive, for example, stores deleted items in a recycling bin folder. They’ll usually stay there until you delete them manually — but there’s an exception to that rule. If your recycling bin contents exceed ten percent of your total cloud storage, OneDrive will start deleting content from the bin automatically, starting with the oldest content first. And once files are deleted from your OneDrive recycling bin, they’re gone for good. If those files are marked for backup with Carbonite, though, you’ll be able to restore them for up to 30 days even if they’re no longer in your OneDrive recycling bin. Online backup solutions like Carbonite also add an additional layer of version control protection. This is especially useful with services like OneDrive, which currently limits version control protection to native Microsoft file types. Carbonite maintains the three most most recent versions of a file regardless of age. It also keeps one version for each day of the most recent week, one weekly version for the previous three weeks, and one monthly version for each of the previous two months. As a rule, the ideal way to manage content is to maintain files you’re actively working on in your cloud storage sync folder. Once you’ve finished up on a project, move your files to an outside archive folder linked to your cloud backup solution. That way you’re minimizing security risks by having a copy of that file only stored in your extra-secure online backup account. 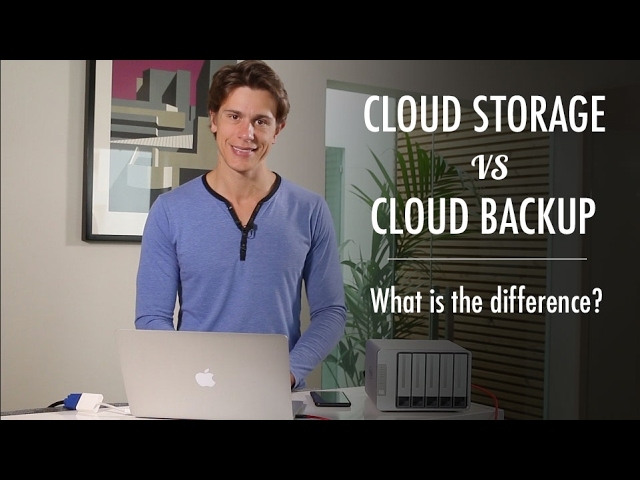 It’s no wonder people frequently mix up the terms cloud storage and cloud backup. The two words seem synonymous, after all. However, if you can start thinking of cloud storage more in terms of work productivity and cloud backup more in terms of data protection, you’ll be well on your way to getting the most out of both technologies. The other advantage of tailoring your use of each type of service based on its maximum potential is that doing so can actually save you quite a bit of money. That’s because most of the work productivity advantages you get from cloud storage services can be obtained by setting up a free account. This is especially true of services like Google Drive, Dropbox and OneDrive, whose most significant value is derived from their integrated applications. Cloud backup services, on the other hand, generally require a subscription. The reason for that is token allotments of just a few gigabytes aren’t enough to fully cover the amount of documents, music files, photos and videos owned by most users. To give you an idea of how implementing a dual solution can also save you money, take a look at the table below. By using free accounts with Google Drive, Dropbox or OneDrive and using Carbonite as your primary data repository, you can get unlimited storage while saving yourself the costs of paying for a 1TB cloud storage plan on top of that. Better yet, an unlimited storage plan with Carbonite is also quite a bit cheaper than any of those options. Do you have a different strategy to keep your data safe? let us know in the comments below, thank you for reading. Why would you use more than one cloud storage, i.e. Dropbox and pcloud? Good question! Dropbox and pCloud do some different things from each other. Dropbox has more integrated app functionality, while pCloud has better security and content control. So Dropbox is better for collaborations, while pCloud might be used for more sensitive materials. I want to use some type of storage system that lets me put my Lightroom catalogue as well as a TB or so of photo files, JPG or RAW, in one location and access the them from either my desktop or laptop computers. It seems like a storage approach like Dropbox or pCloud might do the job more efficiently. What are your thoughts?